I am concluding my month-long celebration of nature and of looking closely at the natural world around us with a book that explores the way each of us sees things differently. We are both the same and unique at once, and that itself is something to celebrate! Opening Sentences: There are so many things in the world, so many important things to be taught, to be shown. But the best things, the most important ones of all, are the ones no one can teach you or show you or explain. No one can discover them but you. Synopsis: In this book, Douglas Wood, author of Old Turtle and Miss Little’s Gift, among others, shows how each person is unique and how no one can experience nature, or life, or anything else in exactly the same way as you. To do this, he takes experiences that we share, and proclaims and celebrates the fact that although we each experience them, we each experience them in our own special way. “No one but you can walk through a rain puddle in your bare feet.” The illustrations are beautiful, each double-page spread featuring a child experiencing some facet of nature very closely, and very personally. It is not so much a story as a litany of celebration of the individual in the context of nature appreciation. As such, it’s the perfect book with which to close my month-long look at picture books that encourage kids to look closely at the natural world around them. Activities/Resources: The activity that I encourage along with all nature books, to go on a nature walk and look as closely as one can at the wonders of nature is taken one step further with this book, in suggesting that the children reflect on how their experience is unique in all the world even though it seems just the same as that of the person next to them. On a blog called Two Writing Teachers, the teachers take this further, by suggesting that kids write about their own unique perspectives on a nature walk. Activities that celebrate individuality and uniqueness, even those unrelated to nature, would be excellent accompaniments to a reading of this book. A class doing an art project or a writing exercise from the same model or prompt, then sharing their work, and non-judgmentally noting the different ways the same inspiration can be interpreted is one possibility. Doing an experiment with thumbprints is another, having children put their thumbprints on paper (using washable ink!) and then comparing them. eHow Mom even suggests that using quilting activities with second graders (and with others, as far as I’m concerned!) can illustrate individuality. That is a lovely concept to learn early Beth. Those opening lines are beautiful and thumb prints are a great idea. Thanks! Thanks, Catherine! I was delighted to discover this book. I’m so glad you love nature walks, Erik! I love the cover, too. And the art inside is wonderful, as well. 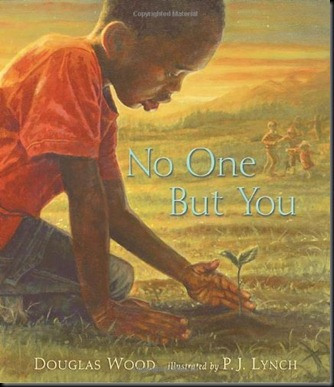 I not only love the concept of this book, I love the fact that it seems to be narrated by an African-American boy even though it is not a “race issues” book. We need more books featuring children from all cultures as they are in the world. It actually features all kinds of children in all kinds of natural settings. Thanks, Julie. i love the concept! I think this book should be in every school. I do agree with the Julie that I enjoy and can hear the unique POV and how I agree with the message that we will all experience nature in our own unique way. Loved your October theme, Beth! Thanks, Joanna. I enjoyed doing this theme, and finding just the right books — I read many that didn’t quite make the grade. This one crowned the lot. This seems like such a lovely, tranquil book. I can’t wait to read it. It is, indeed, lovely, tranquil and yet so empowering. Thanks, Kirsten. Enjoy! It’s filled with a diverse group of children, which is, i think, quite lovely. Hopefully you will do another monthly theme on nature! Love PJ Lynch’s art too! I may make it an October tradition, because it ties in so well with the season, and with Bev’s and Julie’s birthdays. The other Julie, that is. Thanks, Julie! This book looks wonderful. I’m excited especially to see the art up close. Thanks for a beautiful recommendation. Thanks, Laura — the art is lovely. Enjoy! I am all over this stuff these days. Thank you for sharing. It looks amazing. Thanks, Kimberley! I hope you get a chance to read the book, you’ll love it, I’m sure. It sounds like a gorgeous book, Beth. I love reading nature books to my kids. I want to help them appreciate our beautiful world as much as they can. I’m so glad you read nature books to your kids. It’s so important. I think they’d love this one. The boy on the cover looks so gentle. I like that. So from the cover, this looks like a gentle kind of book. I like that, too. And kids enjoying nature is almost the best thing in the world. I really like going on nature walks with kids. They see the world much the same as I do. I will be looking for the book. Thanks for sharing it. You are so right about the gentleness of the book, Janet. I’m sure you’re going to love this one! My kind of book! Similar to Suzanne’s review — interesting how that happens. Love the emphasis on being present and how we are connected. Very lovely choice. I am back and trying to catch up. Yes, you’d love this one. Welcome back! This book sounds absolutely lovely, Beth! I love that quote about walking through the rain puddle in your bare feet. What a wonderful message to make children feel special. So glad to be adding this one to our list.! Thanks, Susanna! This is one of the many picture books I’ve ordered through our province-wide library system — sometimes the smaller places have amazing books!